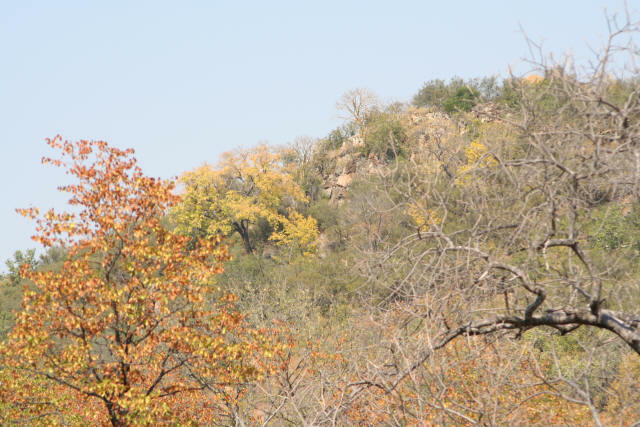 As the Luvuvhu River is approached the country changes dramatically from Mopane shrubveld to magnificent and mysterious woodlands. You can see the vast change by having a quick glance at the map here and comparing it with the previous one. 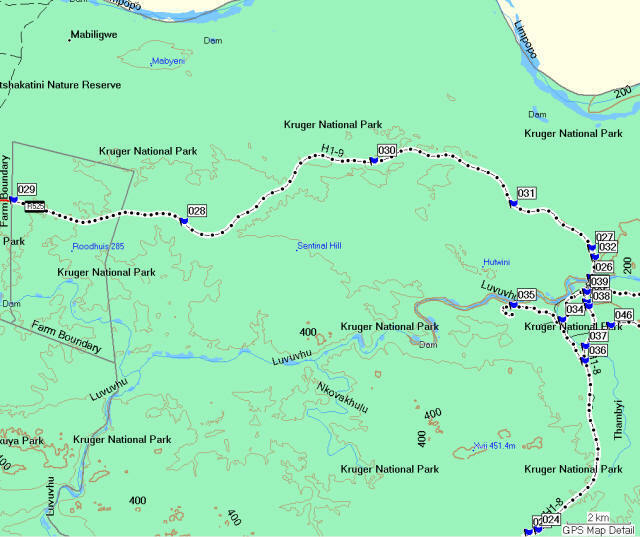 The concentration of waypoints at the Luvuvhu river and road crossing over the river that can be seen on the map immediately suggests that this is a more interesting area and it certainly is. We'll come back to points 33 onwards shortly but first let's complete the drive to Pafuri Gate entrance ... the most northerly park entrance. In February 2000 the Luvuvhu flooded in a spectacular way. The Luvuvhu river normally floods the plains around this area but not to the extent that occurred on 25th February 2000. Take note of the 3 waypoints 038, 027 and 041 on the map when you click to enlarge it. Each of these points is marked by a flood level marker. At 038 and 027 the markers are on the roadside. Point 041 is some 12 feet up on a tree trunk (at the Pafuri Picnic Spot). The scale is shown on the map so you can see in this area alone the flood waters stretched to make the Luvuvhu river some 2 kms wide. I estimate at the peak the river was some 25 to 30 metres deep. 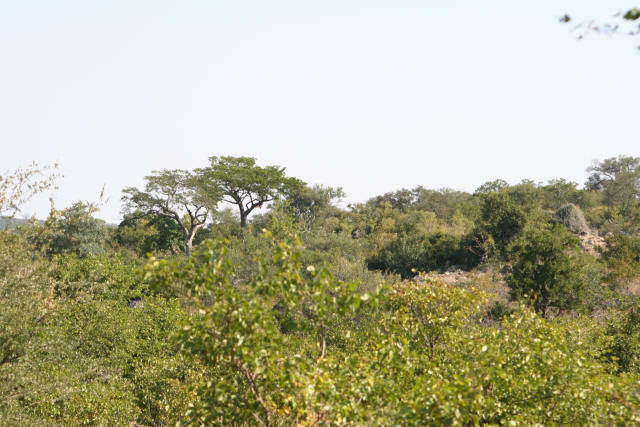 The Luvuvhu is a perennial river and one of only a handful in the Kruger National Park. The flooding was exacerbated by the damming effect that the Limpopo river has on the Luvuvhu ... the confluence of these 2 rivers is quite close to the bridge and Pafuri picnic spot. 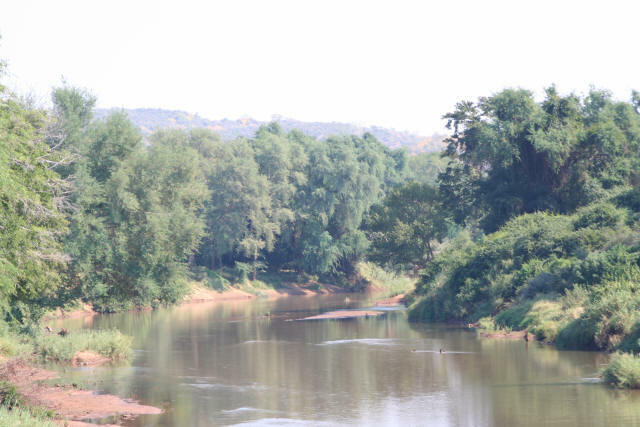 The Luvuvhu river as I saw it in May 2006 ... peaceful, gently flowing and mysterious as all Kruger Park rivers are. Waypoint 025 (hidden behind 038) is the first of 2 bridges that cross the Luvuvhu. In May 2006 the river bed beneath the first bridge was totally dry while the second bridge crossed the real river with water in it. 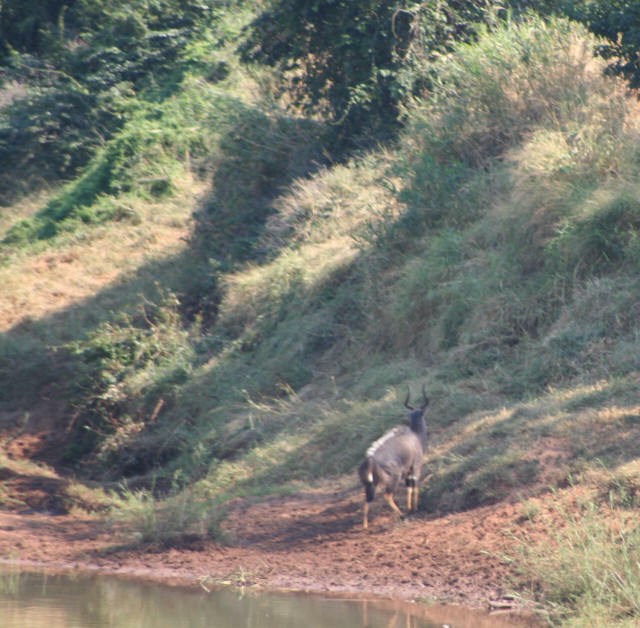 It was here on the river bank that I saw my first Nyala of the trip and I was to go on and see several more. The Nyala is a relatively rare animal and it's important to come North to stand a good chance of seeing these large majestic and powerful antelope with spectacular horns. This picture shows a male Nyala which is much larger and far more striking than the female. Waypoint 026 ... marks the entrance road (private) to the Makaleka and Pafuri Camp. Waypoint 027 ... the start of the long and ordinary drive to Pafuri Gate. Along this road I saw warthogs and some beautiful Fever Trees and many Baobabs and was struck by the tree-like nature of the Mopane in the area. 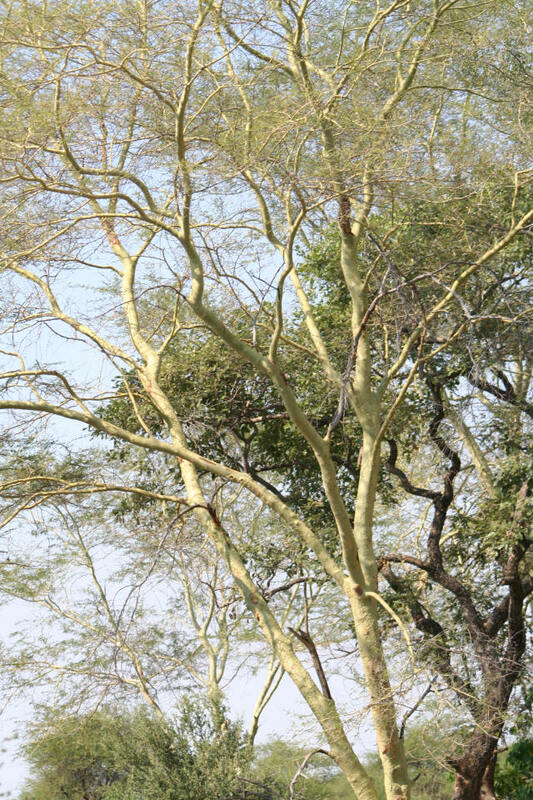 You can drive very close to the Fever Trees here and get a really good view of the pale green yellowish beautiful bark. 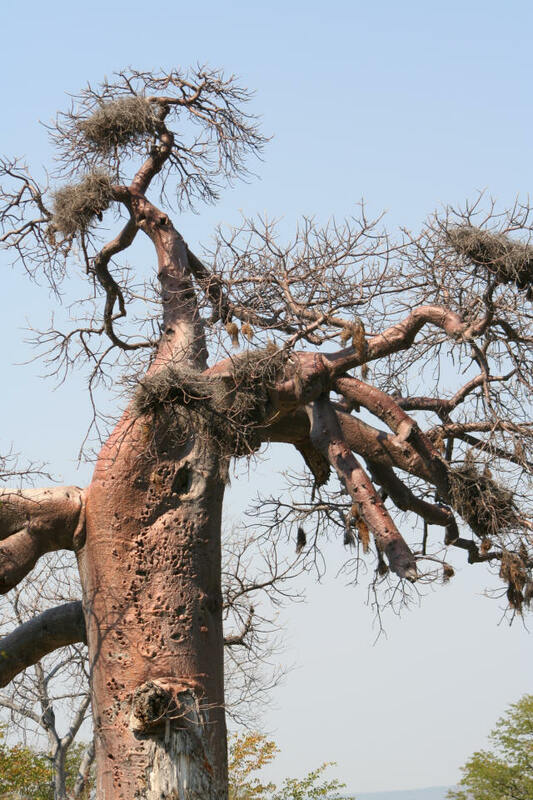 The tree is so called because of its multiple presence in typical malaria regions. Waypoint 028 is the entrance to the "Outpost" concessionary private lodge. It was created as a result of an agreement between the Makuleke People and the South African National Parks. The Outpost is the first concessionary lodge to be built in this region which will border the Trans Frontier Park. The Pafuri Gate entrance at waypoint 029 is almost certainly the least used Park entrance. The staff informed me that they get between 6 and 12 vehicles entering the park daily. They also told me that there are 8 Rhino in the area. Waypoint 030 and 031 are examples of tree scenery. I have chosen to show the Baobab at waypoint 31 ... a wonderful roadside example with unusual reddish colouration. The tree is a favourite nesting place by the looks of it. Continued at the exciting Nyala drive ... one of the very best drives in the whole Kruger Park.